Humans have yet to explore the deep wonders of the sea, but a recent find suggests aliens may have already beaten us to it. Deep below the Pacific Ocean lies what one Martian researcher has deemed ‘a perfect pyramid’. Using Google Earth, this massive structure appears to be 8.5 miles across and some say it could be a UFO parked underwater or an enormous alien base. Marcelo Igazusta, a researcher in Argentina, was the first to lay eyes on the mysterious underwater structure, which was discovered last month. Using the coordinates 12 ° 8’1.49 ‘N 119 ° 35’26.39’ W, Igazusta claims to have spotted a beam of light shining from the darkness of the Pacific Ocean just west of Mexico – leading him to this ‘monumental discovery’. Well-known alien hunter, Scott C Waring, picked up the discovery today and shared it with his followers. ‘It’s a perfect pyramid that measures 8.5 miles across one side of its base,’ Waring writes in his blog UFO Sightings Daily. The massive structure may be hard to make out, as it looks like a blur on the screen, but if you envision a pyramid and squint while looking at the area it might appear in front of your eyes. Waring explains that this ‘perfect pyramid’ is adjacent to the ancient Mayan and Aztec pyramids in Mexico. Although the ancient pyramids were constructed by humans, Waring says ‘Only aliens could accomplish makings such a massive structure’ –referring to the one underwater. WHAT ARE THE DETAILS OF THE SIGHTING? 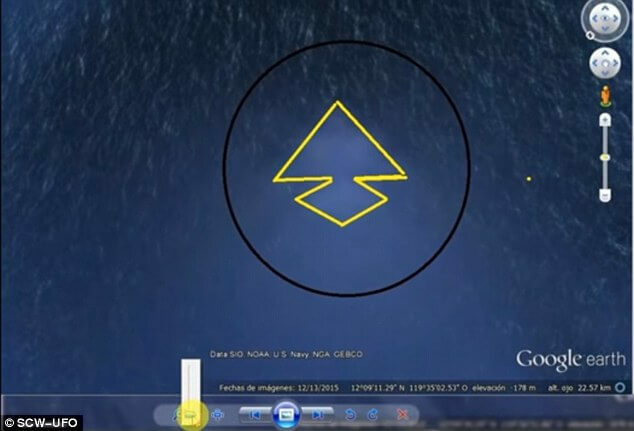 Using the coordinates 12 ° 8’1.49 ‘N 119 ° 35’26.39’ W, Igazusta claims to have spotted a beam of light shining from the darkness of the Pacific Ocean just west of Mexico. Scott C Waring, of UFO Sightings Daily, believes this structure is a parked UFO or massive alien base. Although the ancient pyramids were constructed by humans, but Waring says ‘Only aliens could accomplish makings such a massive structure’ –referring to the one underwater. ‘Even if this is not a UFO that landed in the ocean that was being used as an alien base, it is still a monumental discovery,’ he writes. Google Earth may be the new go-to source to find evidence of alien life here on Earth. In April, Waring posted another sighting – but this time it was a mythical creature. Plugging the coordinates 63° 2’56.73’S 60°57’32.38’W in Google Earth, he claims to have spotted the mythical Kraken swimming off the coast of Deception Island near Antarctica. ‘I used Google ruler and it says this is 30 meters (100 feet) from head to end, but the end looks like just the mid area of a giant squid, which means it could be 60+ meters long with tentacles,’ Waring wrote in his blog last month.